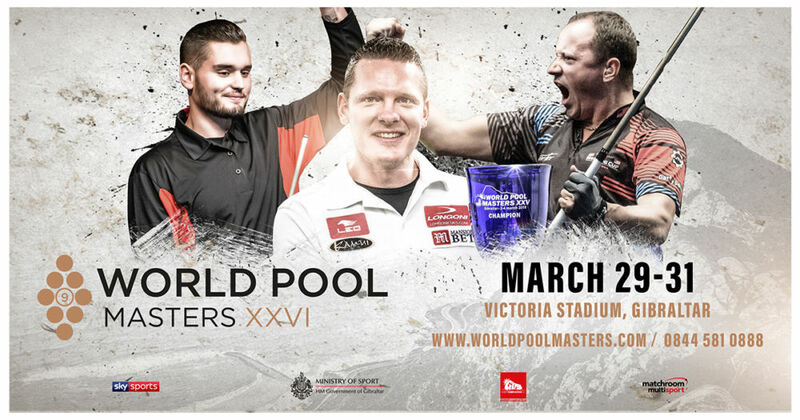 The World Pool Masters returns to Victoria Stadium, Gibraltar next March 29-31 with more players, more matches and an even bigger prize fund. After 25 years of being 9-ball’s biggest invitational tournament, the World Pool Masters expands again for its 26th edition with 24 of the world’s best players set to battle it out for their share of a $100,000 prize fund with the winner in line to take home $25,000. Tickets will be on sale from midday (Gibraltarian time) on Tuesday, October 2nd. For the first time there are now eight pre-determined spots in the World Pool Masters, with a further 15 players invited by tournament promoter Matchroom Multi Sport and the final member of the field selected by you, the fans. The eight pre-determined players will be seeded straight into the last 16, with the remaining 16 invited players – including the Fans’ Choice – contesting the preliminary round. The World Pool Masters will again be staged at Victoria Stadium, Gibraltar. The tournament will commence on Friday, March 29th with the eight race-to-seven preliminary round matches played across two sessions – an afternoon session from 1pm and an evening session beginning at 7pm. The Last 16 will take place over the two sessions on Saturday, March 30th before finals day on Sunday, March 31st sees all four quarter-finals in the afternoon session. The evening session sees the two semi-finals played as a race-to-eight before the race-to-nine showpiece final determines the destination of one of pool’s most sought-after titles. Among the eight players seeded into the Last 16 is defending champion Niels Feijen, reigning US Open champion Jayson Shaw, European Champion Konrad Juszczyszyn and Asian champion Ko Pin-Yi. The four remaining seeded players will be the WPA World No.1 male and female players (as of December 31st, 2018), the 2018 World 9-Ball Champion and the MVP at this year’s partypoker Mosconi Cup. The first two unseeded players have already been confirmed by promoter Matchroom Multi Sport. They are two-time World Pool Masters champion Shane van Boening, and current WPA World No.1 Eklent Kaci. Should Kaci remain as World No.1 at the end of the year he will take up his place as one of the seeded players. For more details including prize fund break down on the 2019 World Pool Masters, visit www.worldpoolmasters.com. Further players will be added to the line-up on a weekly basis. For all the latest World Pool Masters news follow World Pool Masters on Facebook, Twitter and Instagram. Tickets go on sale at midday Gibraltarian time (11am UK) on Tuesday, October 2 priced at just £7 for afternoon sessions and Friday evening and £12 for weekend evening sessions. Daily tickets are priced at £10 for all day Friday and £15 for Saturday or Sunday. A season ticket including admission for all six sessions costs just £34.99. All tickets will be available from www.worldpoolmasters.com.